Entire nations crying out in triumph. Millions suffering heart-break. The biggest stage on the planet. That’s right, folks- it can only be the FIFA World Cup. The biggest competition in world football is set to return next June, as countries across the globe travel to Russia in the hope of grasping the coveted golden trophy. With the likes of Brazil, Germany, Argentina and Spain already qualified, we’re looking forward to seeing the biggest players around do battle like never before. Cristiano Ronaldo. Lionel Messi. Neymar. Antoine Griezmann. Toni Kroos. This is the kind of high calibre we can expect to see in next summer’s showdown, and only time will tell who’ll be crowned World Champions at the Luzhniki Stadium on 15th July 2018. Introducing the Sweden 2018 Home jersey. Well, despite the fact that several teams are still yet to qualify and we’re still awaiting the Group Stage draw, adidas are doing all they can to get us in the mood a little early this year. Unleashing a plethora of stunning new international kits for next summer’s World Cup, the guys working with the Three Stripes have certainly got us brimming with excitement. Each of the new World Cup kits harnesses the rich history of each nation, celebrating some of their most iconic international kits and combining this with the latest kit technology. The reigning champions look stronger than ever ahead of next season’s tournament. Boasting the likes of Toni Kroos, Julian Draxler and Thomas Muller, the Germans are bound to do well in Russia- let’s just hope the manager can resist a quick finger-sniff this time around. The new Germany World Cup kit is a celebration of the iconic 1990 shirt, when Germany of course went on to win the tournament in Italy. This classic design has been updated with the latest adidas kit technology, featuring an updated performance silhouette that enhances fit and comfort. If you look closely on the reverse of the neck, you’ll find the world “Die Mannschaft” stitched there, while an eye-catching World Cup winner badge sits prominently on the chest. The only question is: can anyone stop the Germans this time around? Belgium have been touted as the most promising international team on the planet for a number of years now, and it’s high time that they started delivering on that promise. With players such as Eden Hazard, Kevin De Bruyne and Romelu Lukaku looking to tear teams apart, the Belgians are expected to do very well in Russia. Well, adidas will be letting them make their charge to the Final in style, as the new Belgium World Cup kits are absolutely stunning. Featuring some of the most famous components of their 1984 World Cup kit, this fiery number could be just what the Belgians need to spur them on to glory next summer. The vibrant red and yellow colourway integrates the nation’s badge on top of a unique pattern across the chest, with the graphic print offering something a little different to the other adidas World Cup kits. Accompanied by red shorts and socks, we can’t wait to see Hazard and co. going full throttle in the latter stages of the competition- because there’s little doubt they’ll make it that far. Spain are undoubtedly one of the teams with a point to prove next summer. Following disappointing World Cup and Euro campaigns, the Spaniards will be hoping to rediscover the spark that lead to them dominating the world stage in the late 00’s. 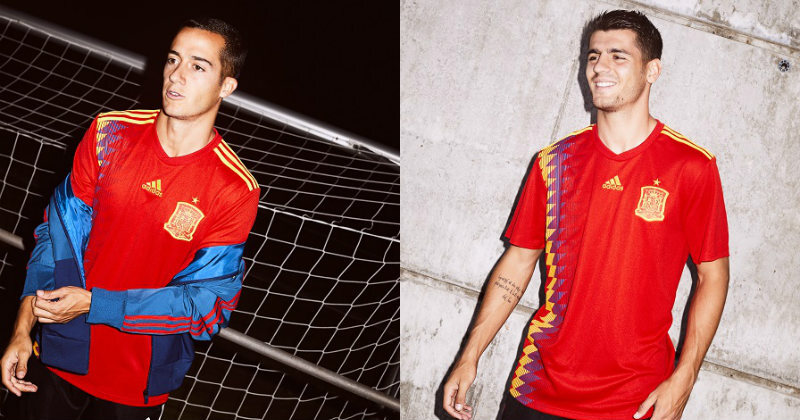 Saluting the iconic kit worn at USA ’94, the adidas Spain 2018 World Cup kit is one of the most vibrant international designs we’ve seen in a long time. Once again using the famous red and yellow colourway that has become synonymous with Spanish football over the years, this gorgeous design features a unique diamond pattern down the right hand-side. We all know how dangerous Spain can be- but the diamonds have been used to remind us of the speed and energy of the Spanish style, just in case we’ve forgotten what they’re capable of. 2017. The Hosts: Russia will be hoping to do their country proud next summer. Image: adidas.co.uk. Next summer’s hosts will be looking to improve on an incredibly flat Euro 2016 campaign, and so it’s nice to see adidas have got them off to a good start. 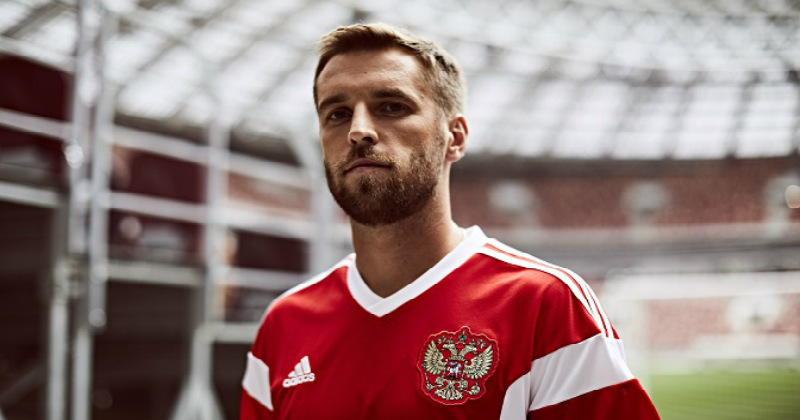 Their new World Cup kit harkens back to the days of the Soviet Union- namely, the famous strip they wore at the 1988 Olympic Games as they clinched an impressive Gold. 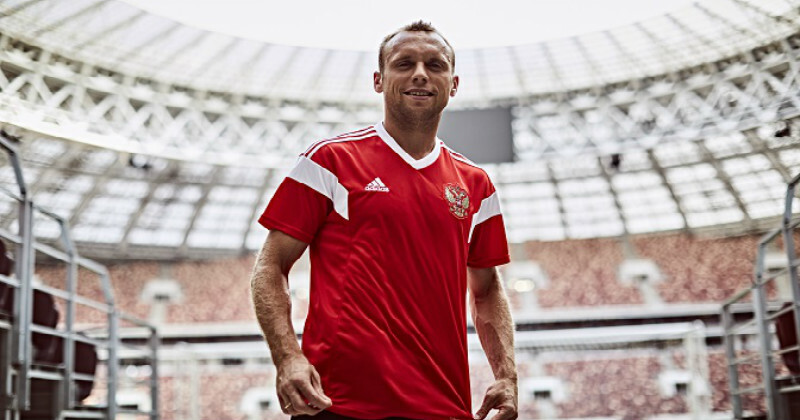 Featuring the Russian flag and eagle, as well as a red and white colourway, this kit demonstrates the sheer pride the hosts have in their country. But will the hosts be able to defy the odds and fire themselves to glory in their homeland? Well, they stand a much better chance than Qatar do! Are you getting excited for World Cup 2018? Compare prices and find the nest deals on all kinds of international football kits right here with FOOTY.COM, so that you can prepare for Russia at the best price possible! The 2018 FIFA World Cup is almost upon us. Adidas have released a stunning collection of nine different away kits ahead of this summer’s tournament- but which one is your favourite? 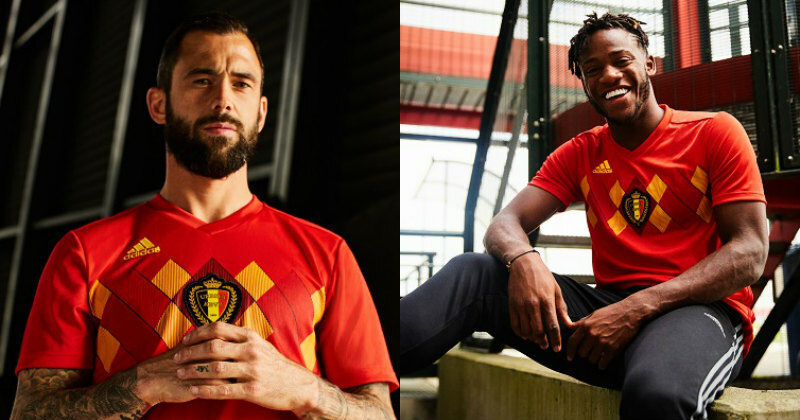 Get your Christmas lists at the ready because Adidas have released another great World Cup 2018 kit- and this time it’s for The Red Devils of Belgium. It’s time for a new generation to fall in love with the beautiful game. Here are the most popular kids’ World Cup kits.